Everyone is entitled to their opinion on climate change, although renowned theoretical physicists may be especially persuasive. This post compares quotes from 3 of the most distinguished: Stephen Hawking (much in the news lately since Trump’s election), Freeman Dyson and Richard Feynman. Hawking is an alarmist, Dyson a skeptic and Feynman concerned about scientific integrity. Stephen Hawking is a phenomenal human being, original thinker on grand design and genuinely concerned about humanity and our planetary home. His own battle with frailty gives weight to his opinions and observations. Thus when he meets with the Pope or Al Gore and warns about future global warming, many people will take his words seriously. Elsewhere he has said, “I don’t think we will survive another 1,000 years without escaping beyond our fragile planet,” going on express concerns about consuming earth’s natural resources, nuclear war, climate change, genetically-engineered viruses and the rise of artificial intelligence spelling planetary doom. Those are his opinions, not shared by other equally distinguished theoretical physicists, two examples being Freeman Dyson and Richard Feynman. Freeman Dyson is best known for his contribution to Quantum Electrodynamics. Quantum Electrodynamics is the field where scientists study the interaction of electromagnetic radiation with electrically charged matter within the framework of relativity and quantum mechanics. Dyson wrote two books on the subject of Quantum Electrodynamics. His books influence many branches of modern day theoretical physics. In his quest to expand our world of knowledge, properly control nuclear power, and discover more information on quantum electrodynamics, Freeman Dyson has written a large collection of books that explains how he believes that the world should grow more efficiently. I was in the business of studying climate change at least 30 years ago before it became fashionable. The idea that global warming is the most important problem facing the world is total nonsense and is doing a lot of harm. It distracts people’s attention from much more serious problems. When I listen to the public debates about climate change, I am impressed by the enormous gaps in our knowledge, the sparseness of our observations and the superficiality of our theories. We simply don’t know yet what’s going to happen to the carbon in the atmosphere. We do not know how much of the environmental change is due to human activities and how much [is due] to long-term natural processes over which we have no control. Computer models of the climate…. [are] a very dubious business if you don’t have good inputs. The people who are supposed to be experts and who claim to understand the science are precisely the people who are blind to the evidence. Those of my scientific colleagues who believe the prevailing dogma about carbon dioxide will not find Goklany’s evidence convincing. . .That is to me the central mystery of climate science. It is not a scientific mystery but a human mystery. How does it happen that a whole generation of scientific experts is blind to obvious facts? Richard Feynman revolutionized the field of quantum mechanics through conceiving the Feynman path integral,and by inventing Feynman diagrams for doing relativistic quantum mechanical calculations. Further he won the Nobel prize for his theory of quantum electrodynamics, and finally in particle physics he proposed the parton model to analyze high-energy hadron collisions. He died in 1988 before global warming obsession was popularized, and so his comments apply mainly to how scientific theories should be treated with integrity. Hawking has gone to the dark side, foreseeing disaster from numerous modern developments, and includes climate change without challenging the precepts with his considerable critical intelligence. Dyson has analyzed radiative activity in quantum electrodynamics and sees clearly that effects from humanity’s minuscule addition to the trace gas CO2 does far more good for the biosphere than it does harm. 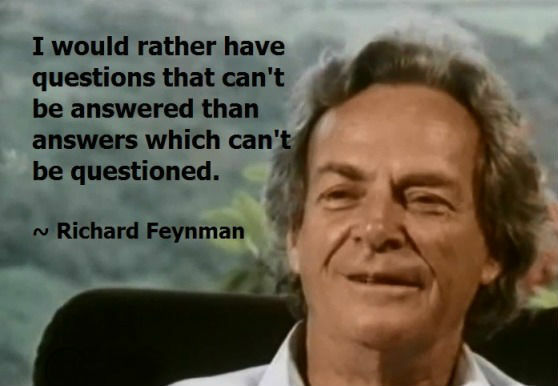 Feynman encourages us not to accept answers claimed to be unquestionable. This post was inspired by Lubos Motl, who blogged similarly on another issue (here), and Ivar Giaever who has long spoken out against alarmist claims. Two more outstanding physicists who have actually examined global warming claims and found them wanting. I like quotes from great thinkers. The one I find the most profound is from Stephen Hawking. The greatest enemy of knowledge is not ignorance but the illusion of knowledge. – Peer-reviewed papers held as the ultimate answer, with the peer-review being tantamount to perfect quality control. – Looking to “expert” opinion in preference to checking the data. An extreme example is in temperature homogenisation, where data sets compiled by consensus “experts” are preferred to the satellite data sets with far greater readings, but far more accurate instruments, with an even spread over the planet surface. – Believing consensus belief on banal questions over actual predictive accuracy. The Doran and Zimmerman 2009 97% consensus paper was an arbitrarily chosen group of 79 people out of over 3000 responses. Belief that some warming past warming has been human caused is no substitute for showing there is an emerging catastrophic problem. – As climate data is incredibly complex, with very little actually measured, the ability to show the emerging problem is demonstrated by getting a track record in predicting some of the signs. But every bold prediction (In Milton Friedman’s 1953 use of the term) has turned out to be wrong. These include (i) worsening hurricanes in USA post 2005; (ii) Summer Arctic sea ice effectively disappearing by 2013; (iii) accelerating sea level rise; (iv) accelerating rate of global temperature rise following the acceleration in the rise in GHG emissions post 1998; (v) up to 50% reduction in crop yields in some African countries by 2020; (vi) accelerating polar ice cap melt in Greenland and Antarctica; (vii) millions of climate refugees; (viii) the disappearance of the Snows of Kilimanjaro etc. etc. – The failure to recognize one’s owns biases, whilst grossly exaggerating and distorting the biases of skeptics. e.g. Naomi Oreskes on Big Oil funding, or Lewandowsky on Conspiracist Ideation. whilst Lewandowsky’s own surveys show an extreme political bias by believers in the data. It is just a shame that Prof. Hawking does not follow through on his own thoughts. But there are few great minds that have understanding that transcends their own subject areas. 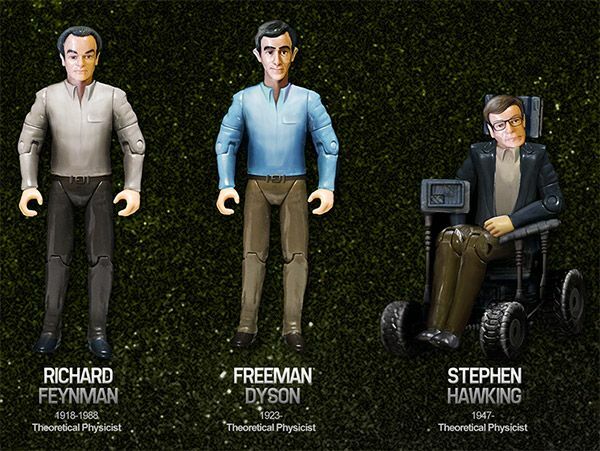 In this respect Hawking keeps company with Einstein rather than Feynman or Hayek.